Shirt, Pants, Boots, Wrist Communicator, Vest, Rank Insignia, Belt, Belt Buckle, Front Pouch, Back pouches (2-3), Holster with optional blaster and hair style with optional leather “x” detail. Shirt, Pants, Poncho, Boots, Wrist Communicator, Belt, Belt Buckle, Front Pouch, Back pouches (2-3), Holster with optional blaster, Hair style with optional leather “x” detail, Optional vest and optional helmet. b. Each sleeve features a vented pocket (approximately 4” by 5” / 10 cm by 12.5 cm) and flap partially sewn to the outside of each sleeve. The pocket should lay over the cuff. c. The collar on the shirt is loose fitting, and have a pointed shape. d. The shirt closes right over left and lie open to the upper breastbone with no visible closures. Cool pale blue/grey-blue twill pants, tailored with a natural waist height. a. A solid burnished yellow or gold non-shiny stripe approximately 1” / 2.5 cm wide on each side seam. b. The pants should fit loosely enough to billow slightly at the top of the boot. Low-heeled, black leather or leather-like, non-shiny boots. Boots must be over calf and loose-fitting. There are no visible laces, buckles or straps. No zippers unless covered or a black zipper located on the inside of the leg. Black and silver watch-like communication device on left wrist with a black strap. Painted and weathered. Dark forest or dark drab green approximately 2” / 5 cm wide twill belt with the following details: a. A black metal slide in front approximately 1.5-2” / 3.8-5 cm in width and 3-3.5” / 7.5-8.8 cm in height. b. One black, non-shiny leather, suede or leather-like pouch (the fuzzy side of pig skin recommended) on the left front. Pouch should have a boxy shape with curved lower edges and feature a thin (approximately 1.5” / 3.8 cm) strap to hold the top in place. c. 2-3 black, non-shiny leather, suede or leather-like pouches (the fuzzy side of pig skin recommended) in the back with no visible snaps. Two braids wrapped around head with a densely braided figure eight-style bun in back. Optional thin tan/light brown suede or leather like cording in a wide “x” pattern over the top of each front braid. Naturally-occurring hair color only (brown preferred); no bangs. If a wig or hairpieces are used, they should be of high-quality and appear like real hair. b. Eight (8) evenly spaced top stitched lines on the costumers back right shoulder ending at the yoke seam. The lines begin at the center of the yoke and end at the costumers shoulder. Four (4) evenly spaced straight lines are top stitched into the costumers front left breast yoke. c. One (1) top stitched line down the entire front left and front right side of the vest ending at the waist band. The stitching should be placed approximately 1″/2.5 cm from the front edge of the vest. d. There is a pocket on the front right and left sides of the vest. The top of the pocket features top stitching approximately 1/2″/1.2 cm from the top of the pocket. This should angle down lower closer to the side seams of the vest reaching the midway point between the hem and armscye. e. A front yoke starting approximately 1” / 2.5 cm from the top of the pocket and angling up toward the side of the arm. f. A back yoke with a center point to either side. g. Top stitching around the armscye, front yoke and back yoke is preferred, but not required. Rank insignia on the front right breast painted and weathered to match screen references. b. Poncho is upper thigh length in front and at knee level in back. c. Poncho is as long as the arm to the elbow or just past elbow level when viewed from the side. g. Poncho is self-lined and inside of the poncho is colored with camouflage detailing. (Both versions) X-30 Lancer Target Blast pistol. a. A tan colored under-helmet based on a WWII era light weight AN-H–15 type flying cap with a custom ribbed top and visor. Ear flaps with black round shapes covering each ear. Mesh should cover the openings in each black round ear flap. b. A hard olive colored outer helmet featuring screen accurate details, inluding 8 (preferred) or 9 black striping in back, 1 red and yellow insignia on front right side, painted, and weathered to match screen references including 3 dents. Top opening is close to the cloth helmet and does not leave a big gap. Black striping should be painted, not indented. 3. 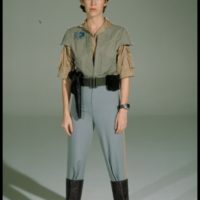 (Commando only) Grey Vest and Rank Insignia (see standards under Endor Briefing Room Version).